I’d been to them all. The best, the worst. The supposed “miracle cures”, the quacks. The famous, the obscure. They had taken all my money – and still I was no better – if anything I was worse. They’d all listened. Said they knew what it was. Said they knew how to help, or there was no help. Still I was the same – I needed help. I was exhausted by the constant bleeding. Weary of being ill. Embarrassed by always being unclean. My relationships had gone. I couldn’t go to anyone’s house and sit on a chair even. I was ostracised and so alone. And then I heard about a man. I’d not heard of him before. It couldn’t do any harm could it? One more person. I was so desperate. But how could I approach him? If what they’ve said about him is even half-true, I can’t go touching him – not in my state. Perhaps… perhaps if I can just reach out and touch him? Perhaps some of his goodness my rub off on me? I have nothing to lose do I? There were people everywhere, such a crowd. I did. I touched him. And it happened. The bleeding stopped. After all those years. All those false hopes. All my rejection. I touched him, and it was gone. Then he turned round. Now I was in for it. He knew what I’d done. He realised he was now unclean. Quick run. But no. He wanted so much more than me being better. He wanted to know my story. He wanted me to know peace. God had met me in my pain, and given me the peace I was longing for. I am free. Released. 25 In the crowd was a woman who had been bleeding for twelve years. 26 She had gone to many doctors, and they had not done anything except cause her a lot of pain. She had paid them all the money she had. But instead of getting better, she only got worse. 27 The woman had heard about Jesus, so she came up behind him in the crowd and barely touched his clothes. 28 She had said to herself, “If I can just touch his clothes, I will get well.” 29 As soon as she touched them, her bleeding stopped, and she knew she was well. 31 His disciples said to him, “Look at all these people crowding around you! How can you ask who touched you?” 32 But Jesus turned to see who had touched him. 33 The woman knew what had happened to her. She came shaking with fear and knelt down in front of Jesus. Then she told him the whole story. I never know how to respond to this encounter of Jesus with this woman. It touches something raw in me. I just have to let it sit. In some ways, this woman’s story could be mine. Going (or being sent!) from doctor to doctor, looking for “the cure” and finding none. There are so many people living, existing, struggling with pain and illness – those we can see, and those we can’t. So clearly God does not always heal by getting rid of the illness. She had suffered for twelve years before her encounter with Jesus. As I said last week, struggle is part of life, being a Christian does not make everything a bed of roses – yet God is in it. God is with us in storms – just because there is one doesn’t mean God isn’t there. Sometimes God heals in the way we expect him to. For this woman he took away the bleeding and pain she had suffered for years. But God’s healing is not always like that – yet I believe it is still healing. His peace and his presence. I don’t know why God heals some people by removing their physical symptoms and others by giving them the strength to live in and through theirs – but it’s on my list of questions to ask him! For me it continues to be a struggle, but I walk by faith in the fact that God knows what he’s doing, that he meets me at what he knows to be my point of deepest need, and gives me his peace in the struggle. Wherever you are today, whatever your story, I pray that God will meet you as you reach out to him, and give you the peace, hope and healing you need. What a wonderful post. These are questions to grapple with for sure. I’m so glad you’ve found the peace of His presence, even in the heartache and the confusion of living with illness. 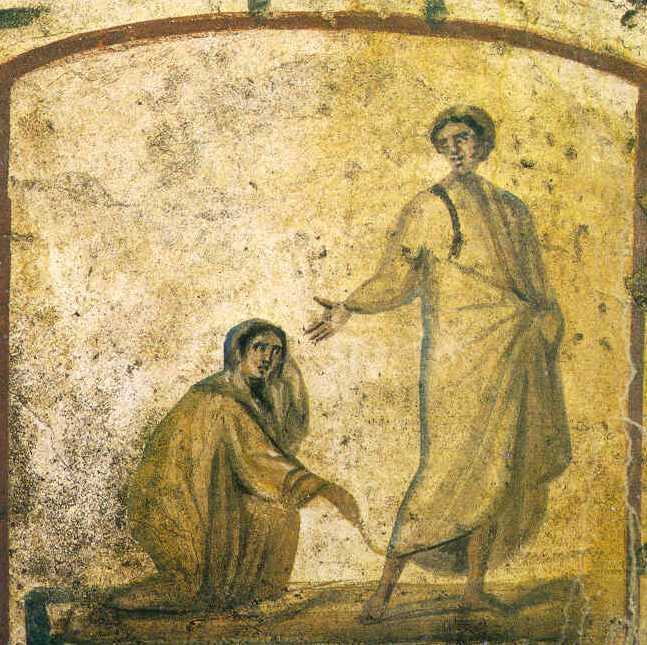 Way we all yearn for Jesus like this woman, and find a deeper healing that helps sustain us through whatever we face.